The School does not close during school holidays with the exception of December/January. During school holidays we offer a holiday care program. We offer a full food program of quality meals and snacks for children 12 months and older. Meals are prepared in our kitchen daily and includes balanced meals. The curriculum at Kiddies Christian Academy is built around specific weekly themes and also allow for seasonal activities and events. We arrange visitors from the local community and we also arrange outings for the children subject to the parents permission. Our program is developed to provide children with a nurturing, safe and enriching environment. 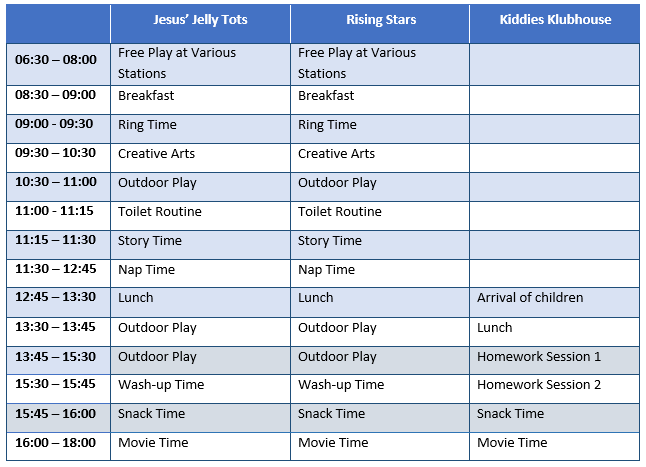 In an effort to make this time fun and rewarding, we provide a variety of activities as well as supervised homework support daily. We provide the time, the place, and the assistance to ensure your child completes their homework completely and correctly.